As women sometimes we can become completely obsessed with that tiny little number on the tag inside of our clothes. For some of us that number is a single digit and for a myriad number of us it’s a double digit. We allow the number on the tag to dictate how we should feel about our bodies and we allow that number on the tag to talk us out of some really good pieces of clothing because we think it’s not going to fit. Well, one of my missions as a plus size blogger is to get my fellow plus size women to stop obsessing over that number in the tag because when it comes to clothes size doesn’t always matter. I am the type of shopper who is at the store early in the morning right when they open. I do this so I can try on everything without the hustle and bustle when the stores begin to get crowded. What I’ve learned from trying on everything is that just because something is your size doesn’t mean that it will fit you and sometimes when something isn’t your size it just may fit you. I think it is embedded in some plus size women’s mind that we must always shop plus. I for one never bought in to that theory because my closet has sizes that range from a 12 to a 20 from brands like BCBG to Lane Bryant. As fashion loving plus size women we should be focusing on the cut and shape of clothing as much as possible. By now we all know that as plus size women we have to get creative with fashion. So it’s important for us to not dismiss things because of that number on the tag. Depending on the trends, pieces can be cut over sized to drape on the body of a smaller woman but on a plus size woman it may give a nice fitted look. Tunics have been on trend for years now and can easily fit a variety of sizes. If a dress is too tight on your hips try it as a top. You should also know that not every brand/designer sizes their clothes alike. I’m always amazed how H&M and Top Shop size large fits my curves so well and sometimes I’m squeezing into a size 2X. It’s mind boggling. From reading my blog you already know that I’m an avid Loft shopper. This summer they had a beautiful red empire waist dress with ruffles at the neck. I picked up the size 16 to try on and it was swimming. Believe it or not I had to go down to a size 12 in order for it to fit. Donna Karan, Juicy Couture, Michael Kors, and Banana Republic are a few brands who offer generous cuts in their clothes and utilize other fabrics besides polyester and Lycra. I’m not saying to buy clothes that are too small. Of course try on clothes that are in your size first, but don’t be afraid to shop in the misses department when you’re plus. Stop looking at stuff and automatically dismissing it because you think it won’t fit or look good on you due to the size on the tag. There’s nothing wrong with just trying. 1. Get to know your shape. It’s important to know what are the larger and smaller parts of your body because it makes it easier for you to browse clothing and have some idea of what will fit just by looking at it. 2. Pay attention to cuts and shapes. Some styles may follow the contour of your body like a sheath dress. Other cuts may slightly flair out away from your body like an A-line. Empire waists can give a little extra room in the middle or it can create a flattering shape. Knowing different cuts will help you determine what styles fit and flatter your body most. 3. Find an experienced tailor and keep him/her on speed dial. Tailors are like magicians they can work magic on just about any garment there is. They can turn dresses into tops an add fabric where needed. It’s just amazing what a tailor can do. I’ve found dresses that fit, but, were too tight for comfort and I’ve had a tailor open up the side seams and add stretch paneling to make it fit. Note: Only do this if you are truly in love with something. 4. Know Your Fabrics. This is just as important as knowing the cut and shape of clothes. Fabric plays a major role in how clothes fit you. Which explains why so many plus designers do stretch jersey because it’s more forgiving than others. Cheaper brands rely on polyester and lycra. 5. Try, try, try! If something looks like it may fit, but, the number on the tag is not your size then just try it on. You just never know. At the end of the day, if it doesn’t fit then so be it. My point is that as plus size women we should always keep an open mind when it comes to shopping. Like the old saying goes, don’t knock it until you try it. 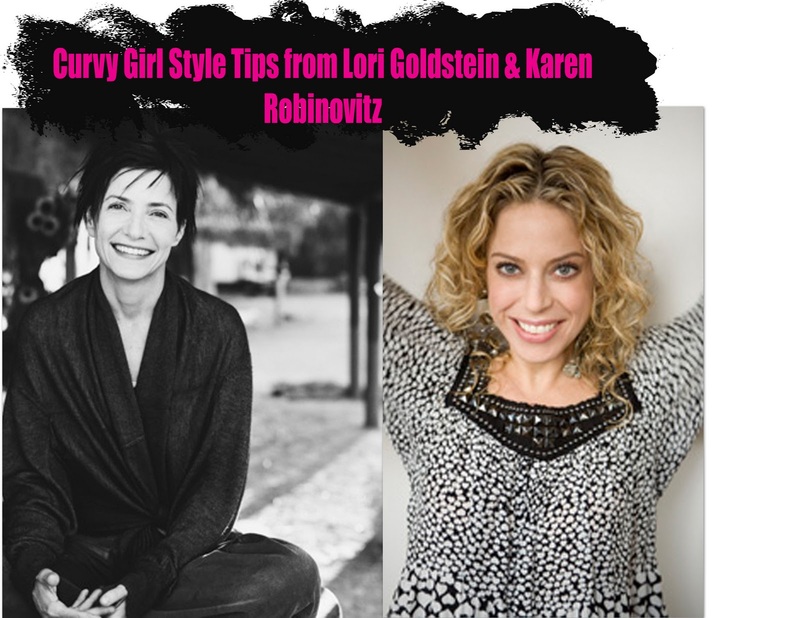 Last year I had the pleasure and honor of meeting two powerful and exciting women in the fashion industry, Karen Robinovitz and Lori Goldstein. I met them both at Lori Goldstein’s house when she was unveiling her Fall collection for her QVC line Logo Instant Chic by Lori Goldstein. After meeting them I was blown away by their personalities as well as their style. They are truly two amazing accomplished women. Lori is a legendary stylilst who has been in the business for over 20 years. She has styled just about every celebrity from Madonna to Rihanna. Karen is a marketing genius who has penned two books and is the creatrix behind Purple Lab Cosmetics plus she has amazing personal style. I thought it would be cool to reach out to these two fabulous industry insiders to get some of their personal and professional styling tips for curvy girls that doesn’t say wear all black and only show your legs. 1. Embrace color and patterns. Play with them to make them work for you. 5. Secret weapon is altering a sleeve length, skirt length, pant length. Changing a little detail like a button can reinvent your favorite piece from last season to a must have for this season. 1.First, be confident and embrace your body. So much of style is not about what you wear, but feeling in good in whatever you wear. If you can’t sell it to yourself, you’ll never sell it to anyone else. 2. Know your body type and what silhouettes work on you, regardless of what the trend is. 3. Play with proportion. If you’re wearing a cropped jacket or sweater, pair it with a longer and flowy Tshirt or blouse and then a slimmer pant to create a nice balance. 4. Make sure you have a good bra and that it’s the right size. I can’t tell you how proper support will elongate your look and improve your posture. Get a real fitting!